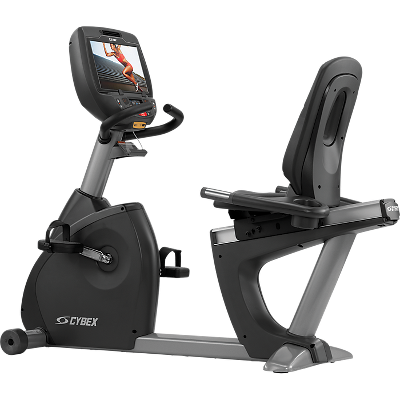 Cybex 770R Recumbent Exercise Bike is the most unique bike in the industry, with three modes of operation and 9 workouts with 21 levels. Cybex 770R Recumbent Exercise Bike has a Target-Speed bar which helps drive the user to an effective training pace. This exercise bike has a Constant Power mode. Isokinetic mode is for serious athletic and rehabilitation training. Stay Cool: An adjustable, dual-speed fan keeps users cool during the most heated workouts, and longer workouts mean better results. Better results = happier members. Seat Engineering: A Cybex proprietary seat was designed by cyclists to provide comfort for the long ride. You need three things: as much surface area as possible for support in the proper areas - while allowing full range of leg motion - while being kind to between the legs. Heart Rate Monitoring: Heart rate can be monitored from either the contact grips or hands free from a wireless heart rate transmitter. See it at a glance with a multi-colored LED that displays a different color for specific target heart rate zones. Resistance Range: The self-tensioning single-stage drive and hybrid eddy-current self-generating brake provide high torque capabilities with exceptionally low drag to provide an exceptionally broad resistance range of 20 to 900 watts with superbly smooth operation. 20 watts is much lower than most other bikes on the market and is important for de-conditioned users. 900 watts “can make a grown man cry” – quote from a veteran cyclist. iPod & iPhone Integration: The 770R comes standard with full iPod and iPhone integration so users can manage their playlists, or watch videos on the optional E3 View embedded monitor while the battery gets charged. Reaching Goals: The Cybex 770R exercise bike CardioTouch allows users to set a Time, Distance, or Calorie goal for their workout. Your members will enjoy reaching their goals and personal trainers will appreciate being able to constantly set new goals for clients. Handlebars: Multi-position handlebars allow users to sit in a more upright position or be comfortable in a more aero position. Dual contact heart rate grips are conveniently located for either position. Portability: Because bikes are more mobile than many other exercise machines, they don’t stay in the same place all the time. The 770 cycles have wheels on the front for easy rolling so they can be moved around. Display: 4.3” Touchscreen for Workout and entertainment setup and control; Graphic display of profile via 8 x 15 LED; Target-Speed display via 2 x 15 LED; Numeric display of time, distance, calories, calories/hour, METs, watts, RPM, and heart rate including multi-color indication of heart rate range. Lower display shows road speed and resistance level. *Note: Most of the sites, stores or shopping portals listed above sell Cybex 770R Recumbent Exercise Bike with discounts and other exciting offers. There is a possibility that the some of above websites are not selling Cybex 770R Recumbent Exercise Bike now. Toughtrain.com is not liable for such cases or instances. Also we do not recommend any seller for Cybex 770R Recumbent Exercise Bike and a buyer should buy from where he/she gets best deal with quality of products, service and on time delivery (shipment).